General oblique aerial view of Minard Castle, taken from the SE. Minard House (Castle). Detail of rainwater head. General oblique aerial view of Minard Castle, taken from the SSW. Minard House (Castle), interior. 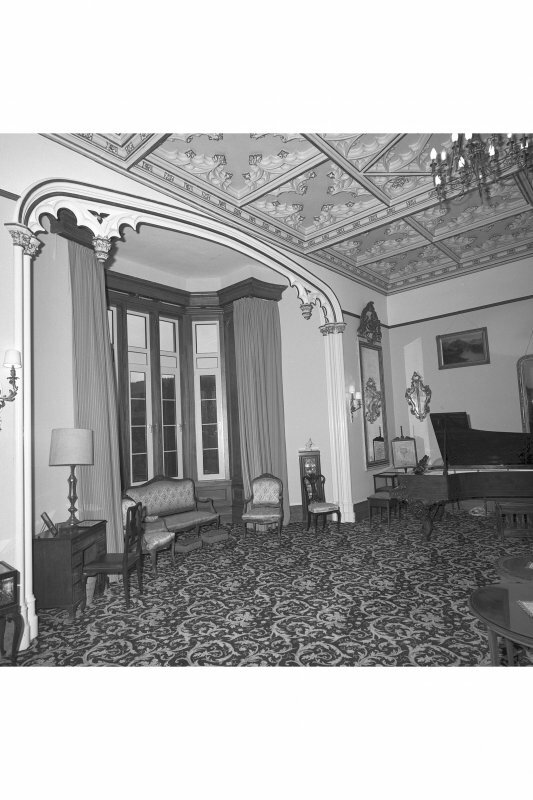 View of first-floor drawing room from South-East. Oblique aerial view of Minard Castle, taken from the WNW. Minard House (Castle), interior. View of stair landing. Minard House (Castle), interior. Detail of ceiling in 'lesser' dining room. Minard House (Castle), interior. View of stair hall and arcade from south. Minard House (Castle), interior. View of first-floor stair-landing from South. 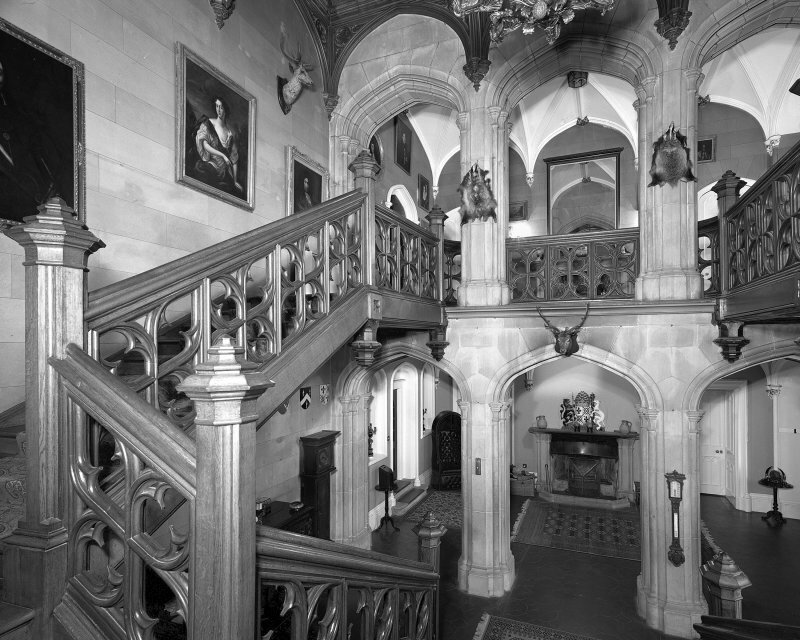 Interior view of arcade and oak staircase in entrance hall at Minard Castle from south. 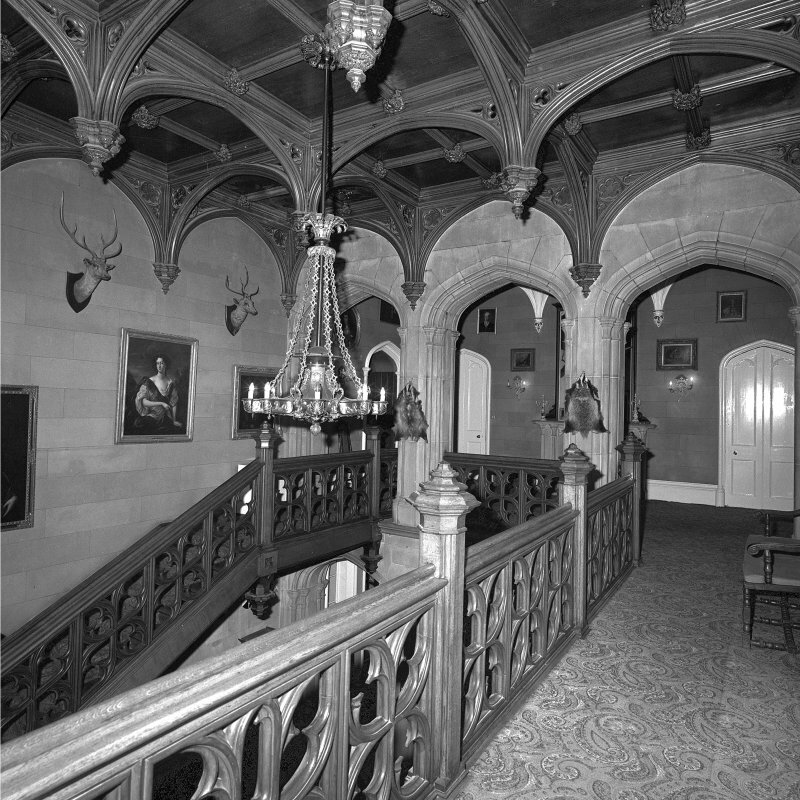 Minard House (Castle), interior. 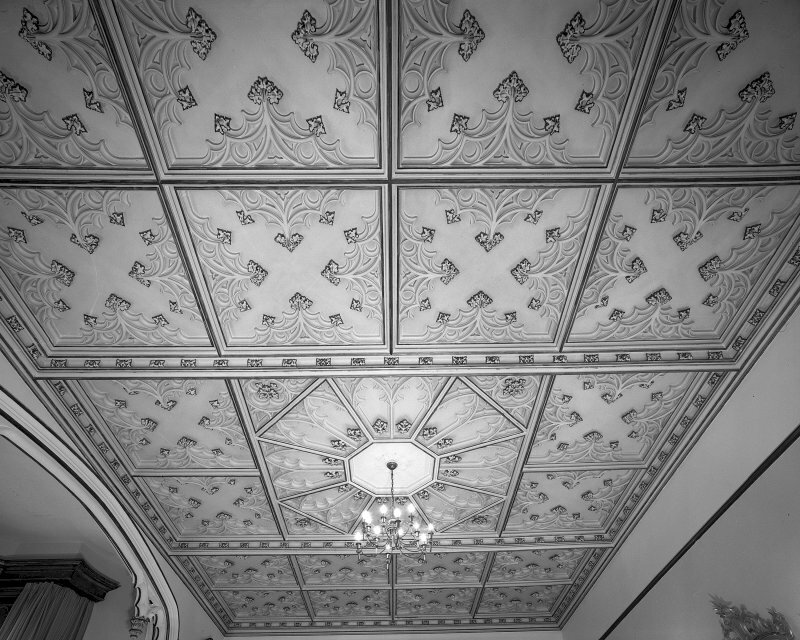 View of ceiling in first-floor drawing room. Minard House (Castle). General view from North-East showing gallery and chapel. Minard House (Castle). Detail of sundial. Minard House (Castle) View of porte-cochere from South. Minard House (Castle), interior. 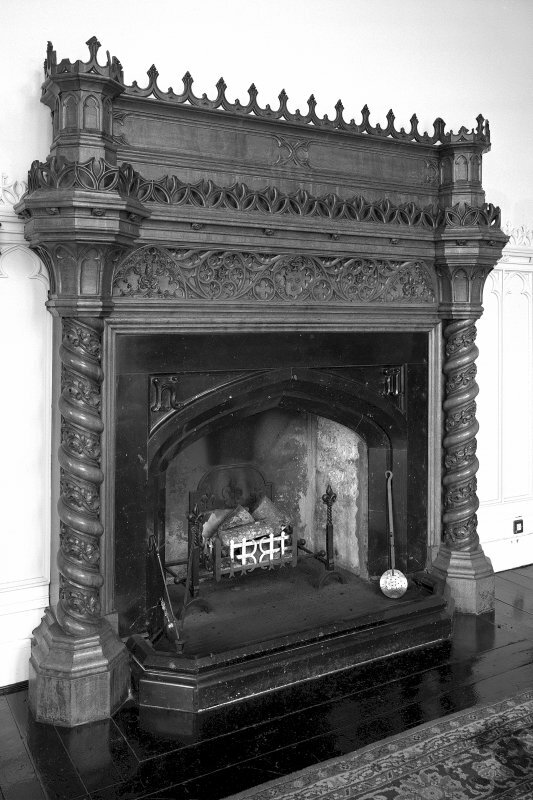 Detail of fireplace in dining room. General oblique aerial view of Minard Castle, taken from the SW.
Minard House (Castle). General view from South. Minard House (Castle), interior. View of bay window in drawing room. 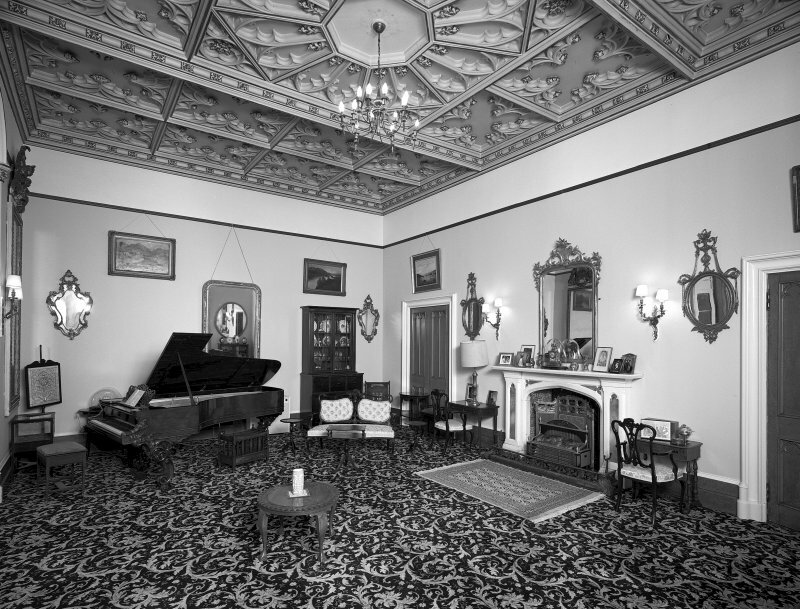 Minard House (Castle), interior. 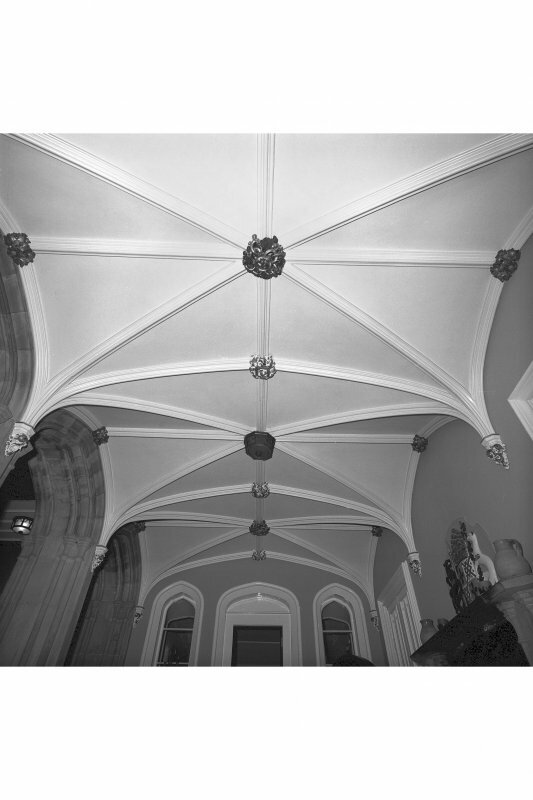 View of vaulted ceiling in entrance hall. Minard House (Castle) General view from West. 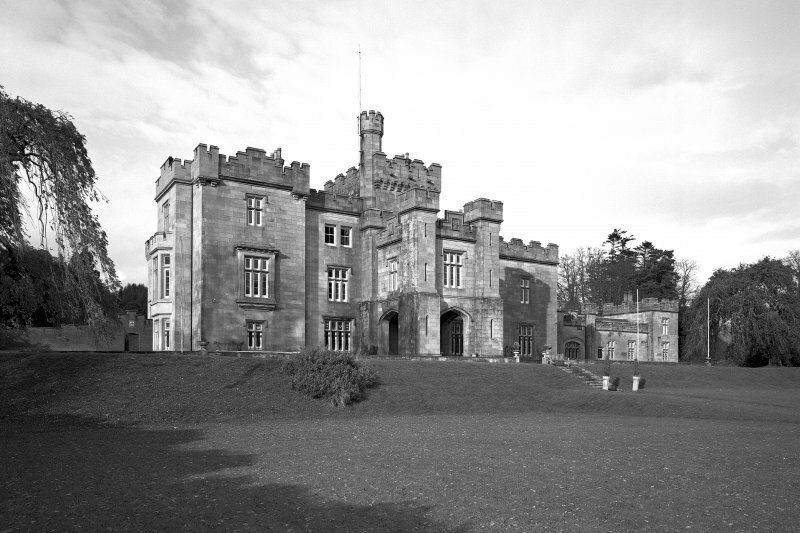 Minard Castle: a 19th-century Italianate building, incorporating the 18th-century house of Knockbuy, which can be seen from the NW front. 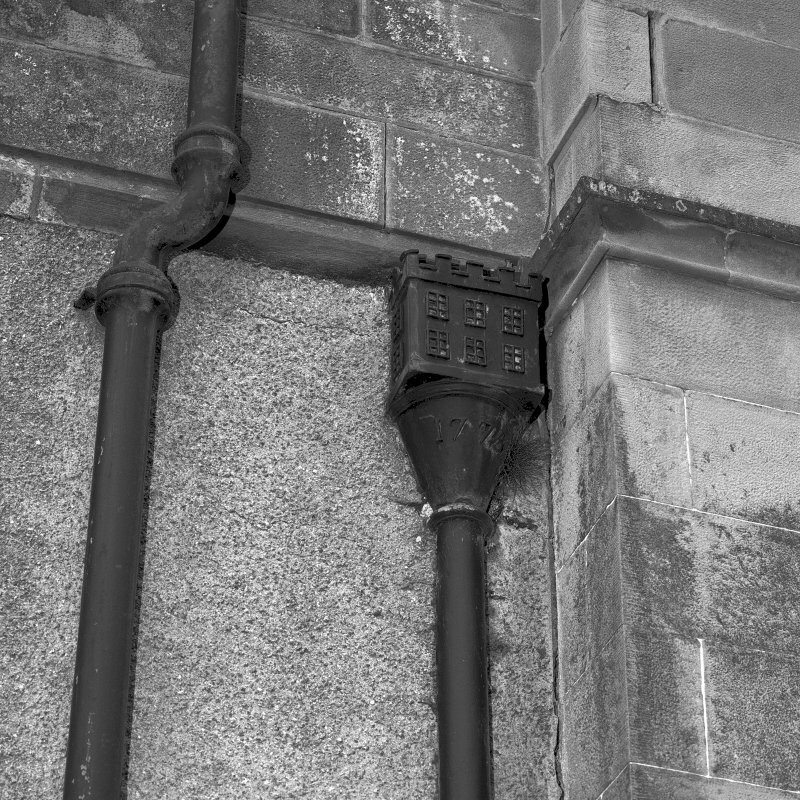 A lead down-pipe bears the date 1707. 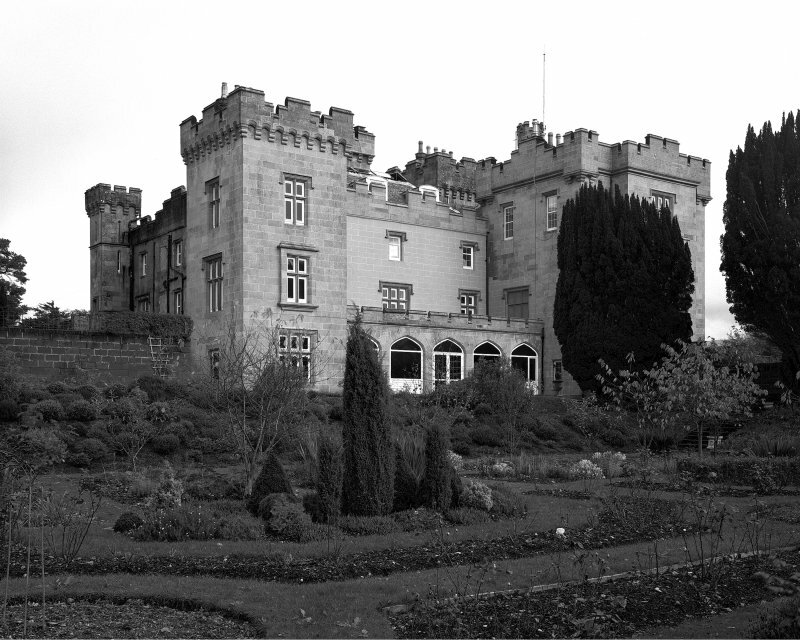 Minard Castle is now Minard Castle Hotel. The down-pipe bears the date 1770. Visited by OS (RD) 15 April 1970. A rainwater-head towards the NW end of the NE side-wall bears the date 1775. 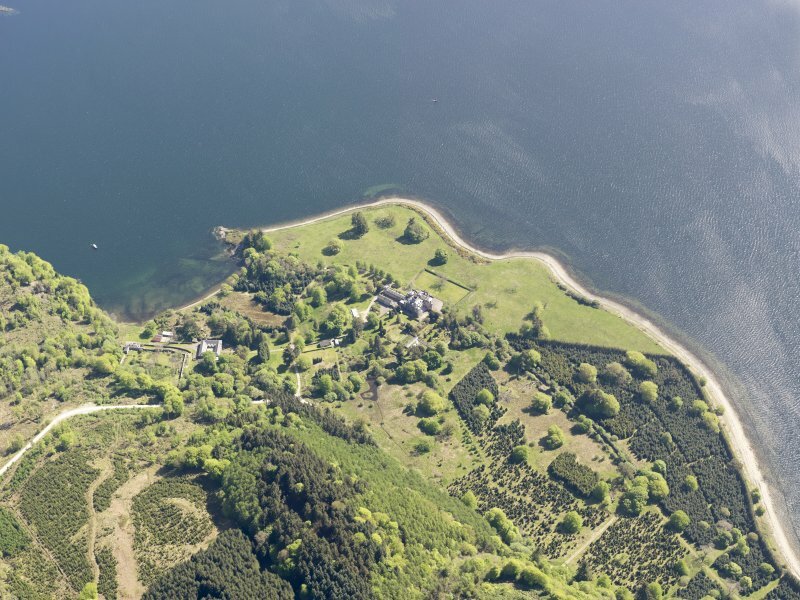 This castellated mansion stands on a low promontory S of Minard Bay, bounded on the E by Loch fine and on the W by steep wooded slopes. 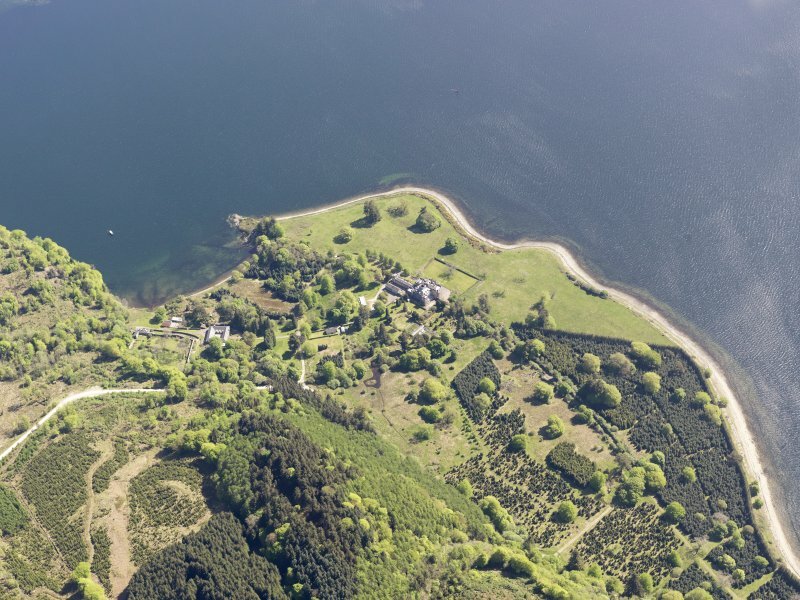 It incorporates a plain Georgian house built on a new site by Archibald Campbell of Knockbuy (1693-1790), a noted improving landlord who since about 1740 had been developing the policies, N and W of Minard Bay, associated with a house near the present Stable House. The building bears the date 1775, but was not assessed for window-tax until 1784 (1) . 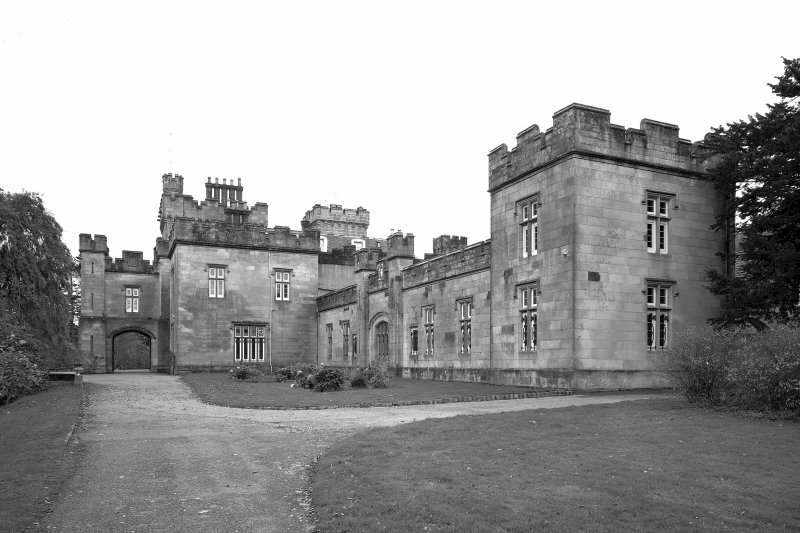 The estate was sold in 1842 to H W Askew, who immediately began extensive alterations and additions, completed in 1848, to the castellated designs of the Glasgow architect J T Rochead. It was owned by the Lloyd family from 1875 to 1938, and after a period of use as a hotel or guest-house it was extensively renovated in the 1970s by the present owner (2). The original house, preserved at the rear of what is now a T-plan mansion, was once a three-storeyed hip-roofed block almost exactly 18.3m (60 feet) square. The harled rear (NW) elevation and the fenestration of the upper levels of the three-bay side-walls indicate its character, the eaves-cornice and plain offset window-margins in grey-green sandstone being clearly distinguishable from the 19th-century alterations, which include label-moulds, mullioned-and-transomed windows, and a crenellated parapet. A rainwater-head towards the NW end of the NE side-wall bears the date 1775 and shows a house with sash-windows and crenellated wall-head. No original features are identifiable in the principal SE elevation, which is totally encased in later additions, but it appears not to have had an advanced centrepiece. The interior has been much altered, and it is not certain that all of the existing structural walls are original, but an inner hall leads to a central top-lit stairwell whose treads have moulded nosings. The two rooms NE of the hall and stair, one of which is the present kitchen, and the billiard room in the S angle, are covered by shallow segmental vaults, probably of 18th-century date. The wall aligned with the NW side of the stair forms a compartment measuring 16.5m from NE to SW by 5.3m at each level, but the existing partitions are secondary and it is not known whether the original lay-out included a gallery or saloon. Rochead added a transverse front block of stugged ashlar masonry, 36m from NE to SW by 7.5m over all, which is two-storeyed to the NE of the central porte-cochere and three-storeyed to the SW. It has mullioned-and transomed windows and crenellated parapets, and the SE front terminated is slightly advanced rectangular towers, that at the S angle having a corbelled first-floor oriel-window at the SE and a two-storeyed bay at the side. A tower with corbelled parapet and tall octagonal E angle-turret rises above the stair-hall behind the porte-cochere, and a smaller tower lights the original stair. A rectangular tower was also added at the W angle of the original house, and a five-arched loggia links in the S tower. To the NE of the front block there is a long single-storeyed gallery-range terminating in a two-storeyed turret which serves as a chapel. 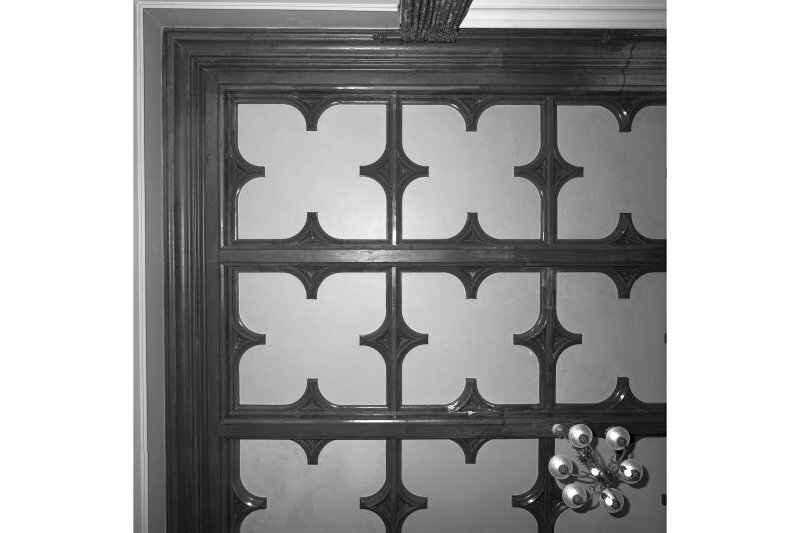 The centre of the gallery bears the armorial achievement of the present owner, and there is a series of armorial shields on the exterior of the porte-cochere. 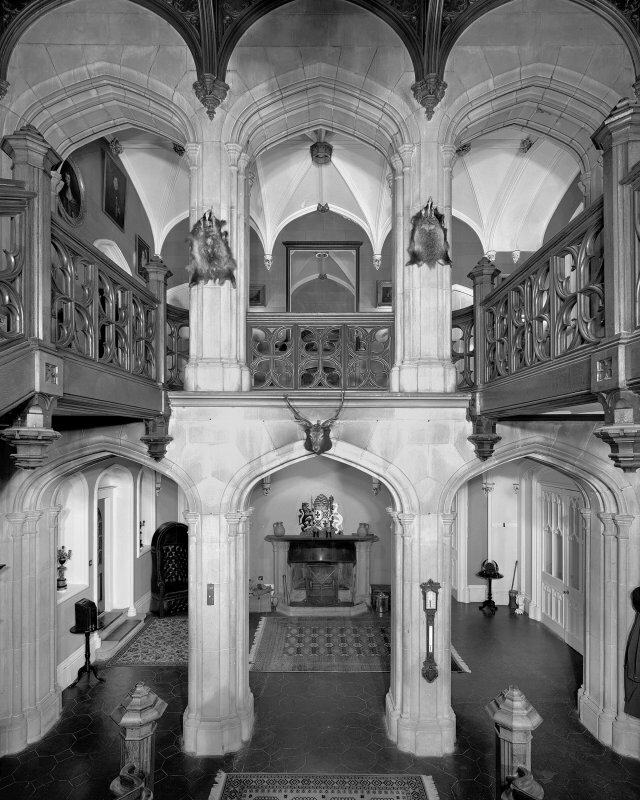 Internally the principal Victorian additions include a suite of public rooms comprising ground-floor morning-room and dining-room to the NE and, to the SW, an oak staircase rising from a plaster-vaulted and arcaded entrance-hall to a large first-floor drawing-room at the S angle. A series of bedroom-partitions was removed in the 1970s from the NE gallery, but its original use is uncertain. (1) Roy’s Map; Burke’s Landed Gentry (1921 ed. ), 279; Knockbuy estate-ledgers in possession of Miss Campbell of Kilberry. The earlier house was assessed for 16 windows in 1748-9 (SRO, E 326/1/7, p.2), and at 14 from 1762 until 1783. In 1784, perhaps when both old and new houses were standing, the assessment was for 51 windows, but it was 30 from 1785 onwards. 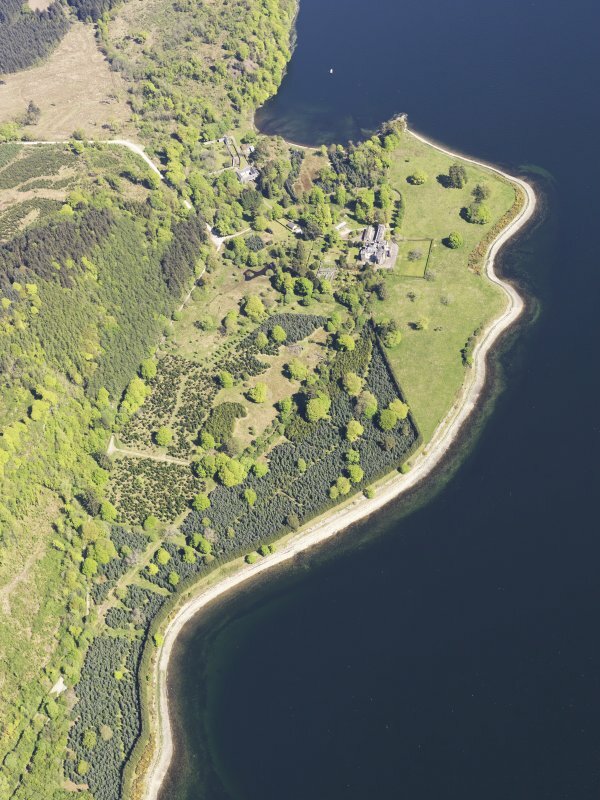 The name ’Knockbuy’, by which the estate and house were known until the 19th century, is derived from the hill and township of Cnoc Buidhe, 3km to the WNW. (2) Fraser, Lochfyneside, 2; Dictionary of National Biography, 17 (1909), 71-2; Dodd, W, ‘J T Rochead, Architect, 1814-1878’ (typescript thesis, University of Strathclyde. 1968; copy in NMRS). The block plan of the house in 1839 appears in a volume of Minard estate plans by J Sang (Argyll and Bute District archives), and a distant view in an engraving of the Minard plan (SRO, RHP 14, 644), which appears to show a belvedere above the central stair. 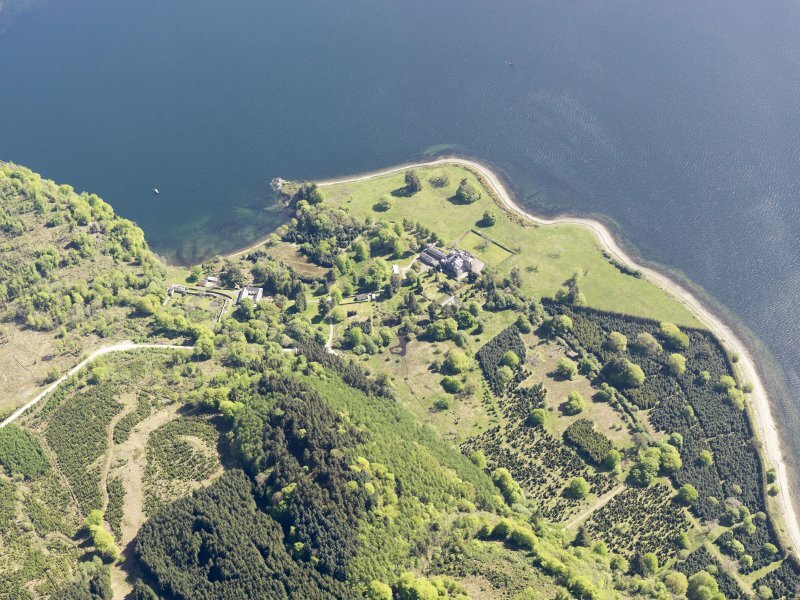 This castellated mansion stands on a low promontory S of Minard Bay, bounded on the E by Loch Fyne and on the W by steep wooded slopes. 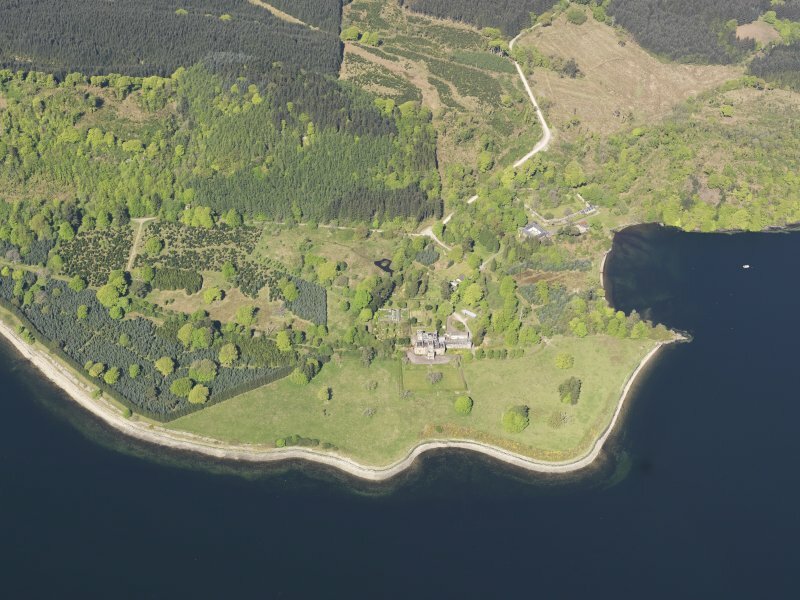 It incorporates a plain Georgian house built on a new site by Archibald Campbell of Knockbuy (1693-1790), a noted improving landlord who since about 1740 had been developing the policies, N and Wof Minard Bay, associated with a house near the present Stable House (infra). The building bears the date 1775, but it was not assessed for window-tax until 1784 (en.1*). 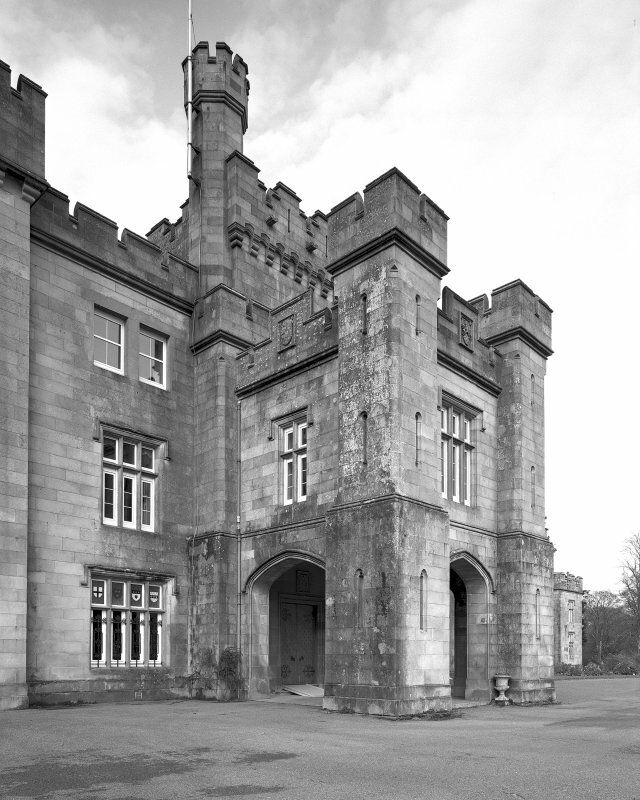 The estate was sold in 1842 to H W Askew, who immediately began extensive alterations and additions, completed in 1848, to the castellated designs of the Glasgow architect J T Rochead. It was owned by the Lloyd family from 1875 to 1938, and after a period of use as a hotel or guest-house it was extensively renovated in the 1970s by the present owner (en.2*). The original house, preserved at the rear of what is now a T-plan mansion, was a three-storeyed hip-roofed block almost exactly 18.3m (60 feet) square. The harled rear (NW) elevation and the fenestration of the upper levels of the three- bay side-walls indicate its character, the eaves-cornice and plain offset window-margins in grey-green sandstone being clearly distinguishable from the 19th-century alterations, which include label-moulds, mullioned-and-transomed windows, and a crenellated parapet. A rainwater-head towards the NW end of the NE side-wall bears the date 1775and shows a house with sash-windows and crenellated wallhead. No original features are identifiable in the principal SE elevation, which is totally encased in later additions, but it appears not to have had an advanced centrepiece. The interior has been much altered, and it is not certain that all of the existing structural walls are original, but an inner hallleads to a central top-lit open-well stair whose treads have moulded nosings. The two rooms NE of the hall and stair, one of which is the present kitchen, and the billiard-room in the S angle, are covered by shallow segmental vaults, probably of 18th-century date. The wall aligned with the NW side of the stair forms a compartment measuring 16.5m from NE to SW by 5.3m at each level, but the existing partitions are secondary and it is not known whether the original lay-out included a gallery or saloon. 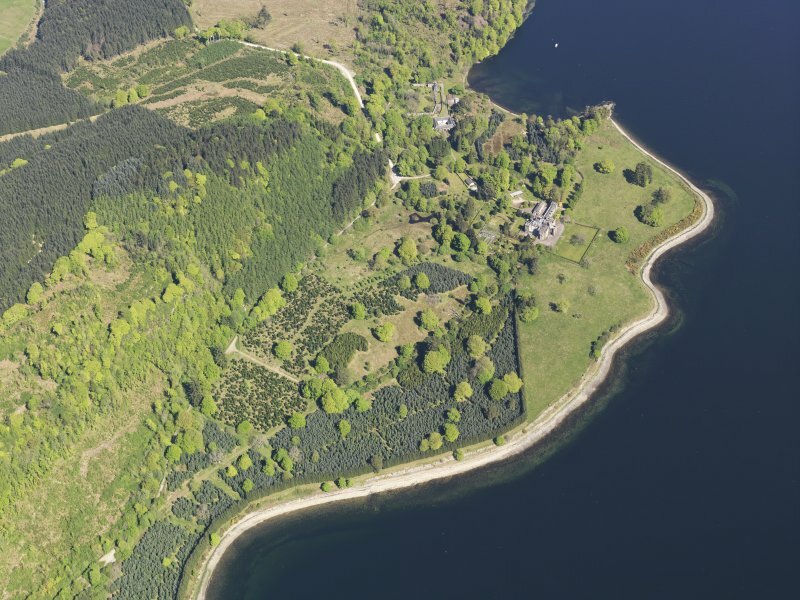 Rochead added a transverse front block of stugged ashlar masonry, 36m from NE to SW by 7.5m over all, which is two-storeyed to the NE of the central porte-cochere and three-storeyed to the SW. It has mullioned-and-transomed windows and crenellated parapets, and the SE front terminates in slightly advanced rectangular towers, that at the S angle having a corbelled first-floor oriel-window at the SE and a two-storeyed bay at the side. 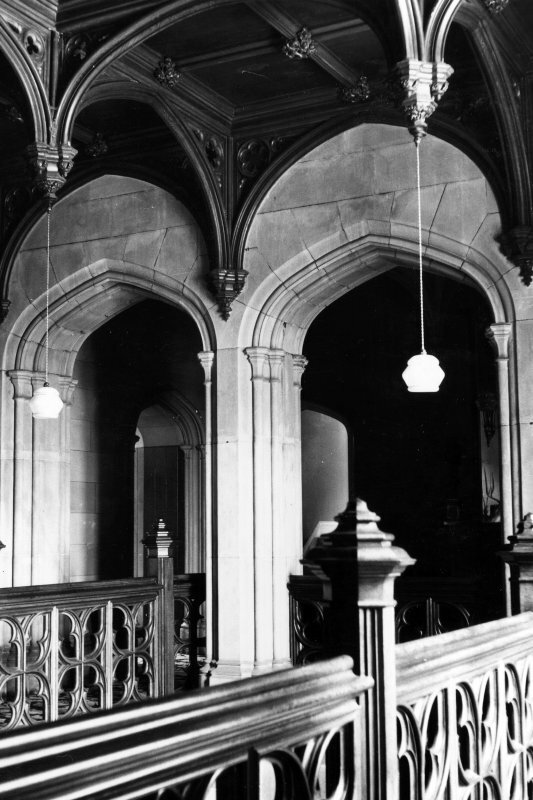 A tower with corbelled parapet and tall octagonal E angle-turret rises above th stair-hall behind the porte-cochere, and a smaller tower lights the original stair. A rectangular tower was also added at the W angle of the original house, and a five-arched loggia links it to the S tower. To the NE of the front block there is a long single-storeyed gallery-range terminating in a two-storeyed turret which serves as a chapel. The centre of the gallery bears the armorial achievement of the present owner, and there is a series of armorial shields on the exterior of the porte-cochere. SUNDIAL. 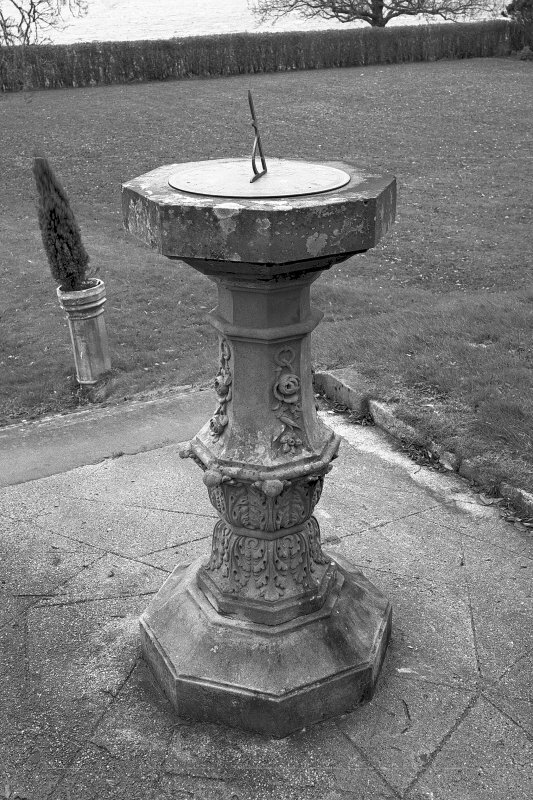 An octagonal baluster-shafted sundial, possibly of 18th-century origin but with a modern dial-plate, stands on the lawn SE of the house. STABLE HOUSE. About 250m N of the house there is at wo-storeyed hip-roofed quadrangle enclosing a cobbled courtyard. Renovated and converted for domestic purposes in recent decades, this early-19th-century group originally served as coach-house, stables and granary for the mansion. The S frontage incorporates a central segmental-arched pend flanked by two arcaded window-bays, and there are blind arcades on the courtyard elevations. The masonry shell of a circular horse-mill adjoins the outer wall of the W range, which evidently served as a threshing-barn and granary. The irregular walled garden to the N existed before 1839, whereas those at the W side of the mansion were formed between that date and 1866 (en.3). BRIDGE. A stone bearing the incised date 1722 has been built into the inner face of the E parapet of a bridge carrying the approach-avenue of Minard Castle over a burn 60m S of the A83 at NR 969952. The rubble-built bridge, whose arch has a span of 2m, has been widened at least twice from its original width of about 2.5m.